Christian Apocrypha and Early Christian Literature A wide range of texts — some showing Gnostic tendancy or influence — survived within the Christian tradition outside of the New Testiment canon. Early Christian Apocrypha A guide to the extra-canonical writings of the first centuries of the Christian era. Early Christian Writings Early Christian Writings is the most complete collection of documents from the first two centuries with translations and commentary. Includes the New Testament, Apocrypha, Gnostics, and Church Fathers. Noncanonical Literature Noncanonical literature documents to aid students and scholars in biblical interpretation including introductions and summaries of many noncanonical works. Old Testament Pseudepigrapha The Old Testament Pseudepigrapha is a loose collection of ancient quasi-biblical writings fictionally attributed to biblical characters or set in the Old Testament period but rejected from the mainstream scriptural canons of both Judaism and Christianity. Archaeological Sites in Israel An index of archaeological sites in Israel. BiblePlaces.com blog A blog written by Todd Bolen that surveys the latest archaeological discoveries in Israel. Institute of Archaeology (Hebrew University of Jerusalem) News about the excavations and other activities of the Hebrew University of Jerusalem’s Institute of Archaeology. Land of Israel Studies and Archaeology (Bar-Ilan University) News about the excavations and other activities of Bar-Ilan University’s Department of Archaeology and Land of Israel Studies. Nadler Institute of Archaeology (Tel Aviv University) News about the excavations and other activities of Tel Aviv University’s Institute of Archaeology. Zinman Institute of Archaeology (Haifa University) News about the excavations and other activities of Haifa University’s Institute of Archaeology. Home for Bible Translators and Scholars HBT is a nonprofit ministry supporting translators and scholars from around the world to deepen their knowledge of the original Hebrew language and the context of the Old Testament Bible while studying in Israel. Summer Institute of Linguistics SIL International serves language communities worldwide, building their capacity for sustainable language development, by means of research, translation, training and materials development. United Bible Societies The United Bible Societies is made up of 146 national Bible Societies operating in over 200 countries and territories. Together, they are the biggest translator, publisher and distributor of the Bible in the world. Midrash A very extensive bibliography of studies that investigate midrash compiled by the Hebrew Union College-Jewish Institute of Religion. The Synoptic Gospels and the Synoptic Problem A recommended list of books and articles (an annotated bibliography) compiled by Stephen C. Carlson for those who wish to read more about the synoptic problem and related topics. Review of Biblical Literature The Review of Biblical Literature (RBL), founded by the Society of Biblical Literature, presents reviews of books in biblical studies and related fields. Taylor-Schechter Genizah Research Unit The Taylor-Schechter Genizah Collection of the University of Cambridge is a window on the medieval world. Its 190,000 manuscript fragments are an unparalleled resource for the study of Judaism and Jewish history. Faulkner Patristics Project An online database of original-language texts with English translations for the Early Church Fathers contained in J. P. Migne’s. Patristics in English Project Patristics In English Project is an online initiative whose goal is to translate all existing patristic texts up until the year 1000 into English and then distribute them freely via the Internet. Classical Studies (University of Michigan) The University of Michigan’s Department of Classical Studies website is an important resource for the languages, literature and history of the Classical Period. Greek and Roman Materials in the Perseus Collection Primary and secondary sources for the study of ancient Greece and Rome (Perseus Digital Library). Global Jewish Database The Global Jewish Database (The Responsa Project) at Bar-Ilan University, which includes Jewish commentaries on the Bible and rabbinic works, is the largest database of its kind. Thesaurus Linguae Graecae (TLG) TLG has collected and digitized most literary texts written in Greek from Homer to the fall of Byzantium in AD 1453. Dead Sea Scrolls Foundation The Dead Sea Scrolls Foundation is the financial support of the official publication of the scrolls in the Discoveries in the Judaean Desert (DJD) Series by Oxford University Press. Library of Congress Dead Sea Scrolls Exhibit “Scrolls From the Dead Sea: The Ancient Library of Qumran and Modern Scholarship” is an exhibition at the Library of Congress, Washington, D.C.
Shrine of the Book (The Israel Museum) The Shrine of the Book is the wing of the Israel Museum that houses the Dead Sea Scrolls discovered 1947–1956 in 11 caves in and around the Wadi Qumran. West Semitic Research Project The West Semitic Research Project, directed by Dr. Bruce Zuckerman, uses advanced photographic and computer imaging techniques to document objects and texts from the ancient world. Neot Kedumim: The Biblical Landscape Reserve in Israel Neot Kedumim, a unique endeavor to re-create the physical setting of the Bible, is a 2,500 dunam garden and nature preserve located near Modi’in, Israel. BiblePlaces.com BiblePlaces.com features photographs and descriptions of sites in Israel, Jordan, Egypt, Turkey and Greece with an emphasis on biblical archaeology, geography and history. Oriental Institute Map Series Seven site maps covering the ancient Near East (Egypt, Sudan, The Levant, Syria, Turkey, Iraq, and Iran), locating primary archaeological sites, modern cities, and river courses. The Barrington Atlas of the Greek and Roman World The Barrington Atlas, created by the Ancient World Mapping Center, provides a set of on-line resources related to ancient geography and cartography. Biblical Language Center A unique program based in Israel designed to give Bible translators and scholars the ability to speak and read ancient Greek and Hebrew with understanding. From Jesus to Christ: The First Christians A FRONTLINE PBS television series that explores the world of Jesus and early Christianity. NTGateway.com The New Testament Gateway, authored by Dr. Mark Goodacre, is a comprehensive directory of academic internet resources related to the New Testament. Every link is annotated. Encyclopedia of Roman Emperors An online encyclopedia of the rulers of the Roman empire and their families from Augustus (27 B.C.-14 A.D.) to Constantine XI Palaeologus (1449-1453 A.D.). Center for Judaic-Christian Studies Founded by the late Dwight A. Pryor, JC Studies provides Christians unique material for understanding Christianity’s Hebraic origins and dimensions. Centre for the Study of Biblical Research CSBR is headed by Dr. E. William Bean, a member of the Advisory Board of the Dead Sea Scrolls Foundation. CSBR provides monthly e-lessons (in PDF and MP3 formats) about the New Testament and the Jewish roots of the Christian faith. En-Gedi Resource Center EGRC is an ecumenical educational ministry whose goal is to help Christians grow in their understanding of the Bible and their Messiah, Jesus, by providing resources to study them within their Jewish culture and historical context. Gospel Research Foundation The Gospel Research Foundation, headed by Dr. Brad H. Young, is dedicated to the scholarly exploration and spiritual restoration of the Jewish roots of Christian faith. Our Rabbi Jesus OurRabbiJesus.com is the website of Dr. Lois Tverberg, author of “Walking in the Dust of Rabbi Jesus” (Zondervan, 2012). On this site Tverberg shares exciting insights into the cultural context of the Bible. Hecht Museum (University of Haifa, Israel) The permanent archaeological exhibition is based on the collection of the late Dr. Reuben Hecht and supplement by artifacts on loan from the Israel Antiquities Authority. The Israel Museum (Jerusalem, Israel) The Israel Museum, with nearly 500,000 objects of fine art, archaeology, Judaica and Jewish ethnography, is Israel’s leading cultural institution and one of the leading encyclopedic museums of the world. B-Greek: The Biblical Greek Forum A forum devoted to Koine Greek texts, Greek language and linguistics, and the teaching and learning of Greek. JerusalemPerspective.com Participants in Jerusalem Perspective’s online forum focus their discussions on the life and words of Jesus in the Gospels of the New Testament. Teach It to Your Children: How Kids Lived in Bible Days “Teach It to Your Children: How Kids Lived in Bible Days” is a book written by Miriam Feinberg Vamosh for Christian children from age 5. What Did Jesus DO All Day? Discovering the Teen Jesus “What Did Jesus DO All Day? Discovering the Teen Jesus” is a book written by Felicia Silcox for Christian teenagers. SEMO.net Jerusalem Perspective and SEMO.net have been partners for over 15 years. JP’s WordPress website is the third version of our site. All three have been designed and developed by Brian Becker and his talented staff. BiblePlaces.com Arguably the Web’s best source of high quality photographs of the lands of the Bible, BiblePlaces.com features photographs and descriptions of sites in Israel, Jordan, Egypt, Turkey and Greece. Israel's National Photo Collection The photo collection of the Israel Government Press Office (approx. 500,000 photographs) was amassed since 1948. These photographs include many photos of antiquities and archaeological sites in Israel. Accordance Bible Software Accordance is the only full-featured Bible program designed explicitly for Macintosh. Whether you need advanced research tools or basic Bible study help, Accordance makes it easy to deepen your study of the Bible. Jerusalem School of Synoptic Research The Jerusalem School is collaboration of Christian and Jewish scholars in the land and language of Jesus, bringing historical, linguistic and critical expertise to bear on the Synoptic Gospels. Synoptic Problem Website Created by Stephen C. Carlson, this site is a major contribution to Synoptic Gospels research. Open the “Overview of Proposed Solutions” page, which includes a discussion of the hypothesis of the Jerusalem School of Synoptic Research. I am absolutely amazed with these references and guides. 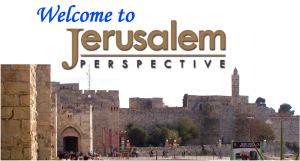 Thank you Jerusalem Perspective – My preaching and teaching will never be the same!